I was looking around Goodwill (my favorite place to come up with a Halloween costumes) and as soon as I walked in I saw this awesome purple vest. I immediately came up with the idea to be Aladdin. I then found the perfect pair of pants. I went home and started to put the creative thoughts together. I needed a Genie lamp, an ABU, and a fez hat. My dog has a stuffed monkey toy that I thought I could use. Unfortunately, the face was bitten off. Later that night I was watching “the Walking Dea” and the idea came to me. 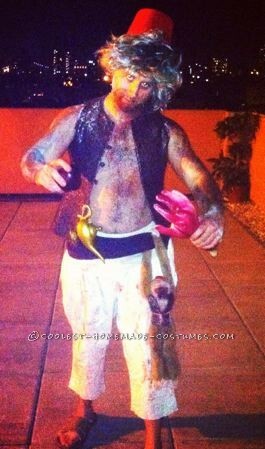 I could be a ZOMBIE ALADDIN! It was perfect, the chewed up monkey could be a zombie ABU. I got the rest of the accessories I needed and zombie make up and blood. I made a small fez and vest for ABU from the same material as my vest. I put everything together and it came out great! People loved my costume and thought it was very original. I was trying to find a zombie Jasmine all night..but no luck.